WFEA (AM 1370, 5kw) has been broadcasting continuously since 9:00AM on March 1, 1932, making it New Hampshire's oldest station. It has always had the same call letters. Licensed to the state's largest city, Manchester, the transmitter plant has always been 5.8 miles away in Merrimack. 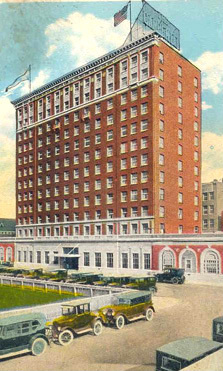 WFEA's original studios were located in the Carpenter Hotel in downtown Manchester. The original licensee, New Hampshire Broadcasting Company, was headed by Henry Pritchard Rines, owner of Congress Square Hotel in Portland, Maine. Rines founded Portland radio station WCSH in June, 1925. In those days it was common for department stores and hotels to own radio stations. Department stores could use stations to enhance the sale of radio sets. Rines saw the obvious benefit of getting double use out of the live performers he paid to entertain his guests. WFEA's first frequency was 1430 kilocycles. "Located on the second floor of the Carpenter, the studios comprise a suite of three rooms, which have been converted into luxuriously appointed broadcasting headquarters. Despite the attractiveness of these headquarters, station officials say they are of merely temporary character, and declare that later on they will be expanded to fit every need of a modern broadcasting studio. "At present the headquarters in The Carpenter consist of a central business office, main studio, 20 by 25 feet square, and a studio control room, where most of the mechanical equipment is located. "Ordinary local programs, speaking and musical, will be broadcast from the main studio, which is large enough to house an eight or nine-piece orchestra. Programs calling for ensembles larger than that will be put on the air from The Carpenter's main dining room, where the acoustics, for broadcasting purposes, are nearly perfect, according to station employees. WFEA was an affiliate of the Boston-based Yankee Network from the beginning. It was also an affiliate of the CBS Radio Network, although it switched to NBC in March, 1937. 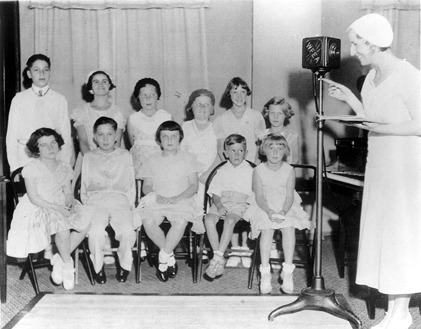 One of WFEA's earliest, and most popular, local offerings was "The Little Theatre of the Air." Every Wednesday evening the troupe of local actors performed original dramas, several volumes of which still exist. Most scripts were written by WFEA's assistant manager, Donald G. Caswell. The regular players included Bernice Maiwald, Alberta Bean, Celan Clark, Reg Cargill and sound effects man Warren D. Caswell. 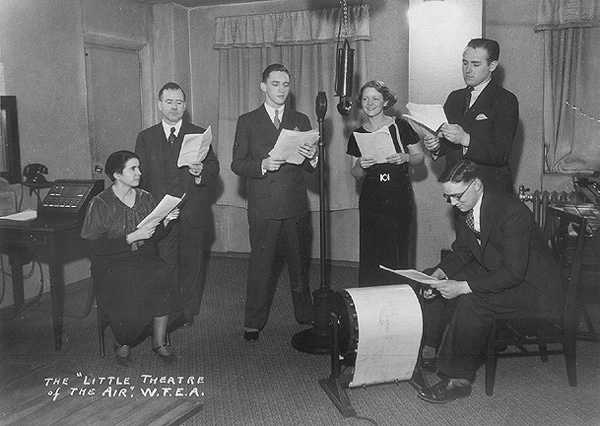 WFEA had Manchester's airwaves to itself through the 1930s. It struggled to stay on the air during the great flood which cut the city in half in March, 1936; telephone wires linking the downtown studios to the Merrimack transmitter were wiped out when two huge oil storage tanks washed down the Merrimack River. 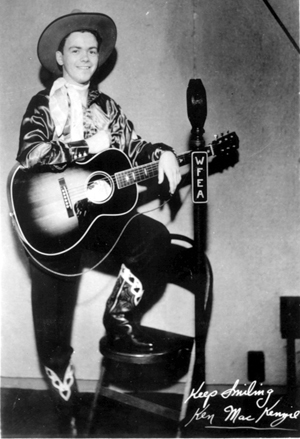 Some of the earliest stars on WFEA were so-called "cowboy singers." The forerunners of today's country music artists, they were available in abundance throughout New Hampshire. At left, Ken MacKenzie, a Boston native who grew up in Concord. He was on WFEA from 1936-38 and met his wife Simone Labrie, a west side resident. 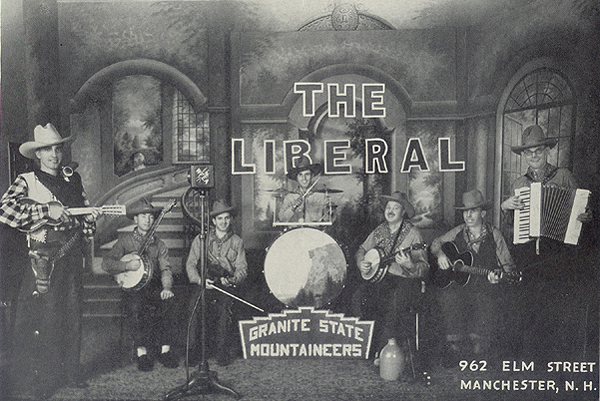 On the right is the Granite State Mountaineers performing for a WFEA microphone at The Liberal on Elm Street. Do any of these young faces look familiar? 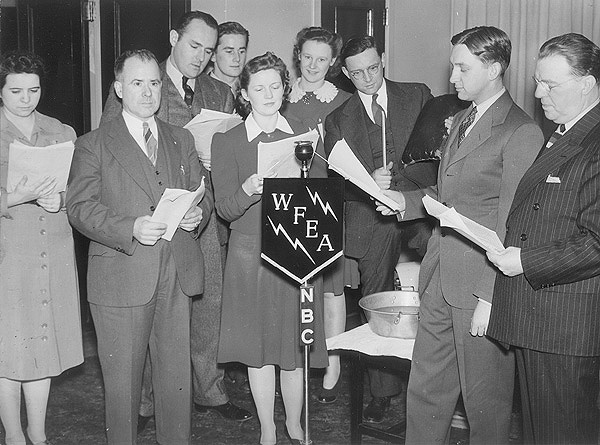 While WFEA signed on at 1430kc, it moved to 1340kc in 1933 and has been on 1370kc since the North American Regional Broadcast Agreement (NARBA) took effect March 29, 1941. On March 1, 1937 WFEA dropped CBS and became affiliated with the National Broadcasting Company; it maintained its Yankee Network affiliation. In late 1938 an affiliation with the Mutual Network was also secured. On March 2, 1939, Henry Pritchard Rines died at the age of 53. Later in the year his role as president of New Hampshire Broadcasting Company was assumed by his widow, Adeline B. Rines. During its long life, WFEA (the original call letters) has had 10 owners. Saga Communications has operated WFEA since April, 1991. Saga also operates WZID FM (95.7) and WMLL FM (96.5) licensed to Manchester and Bedford, respectively.